My MO is comfort first when the feeling that you're blanketed with a wet towel upon walking outside arrives. Who wants to be wearing heavy denim or suctioned-to-your thighs skinny jeans when the humidity is through the roof. 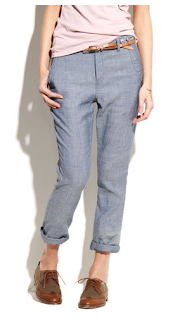 To keep the look of denim but lighten up the sweat production, I think that chambray is perfect. You can still enjoy your "jeans" but in a cooler (literally) and hipper way. Of course my obsession with Madewell is well documented, so you know that my fave is this perfectly slouchy pant that they have worked back to oxfords (so cute) but would be equally adorable with a wedge like this. Of course they have a shorts version too--If you're going slouchy, try to keep the look tucked in on top. You can wear a more blousy shirt, but it's nice to see your waist. This whole look, whether shorts or pants, is so perfect for weekend! Here's a very dreamy one from Rag and Bone too. LOVE.